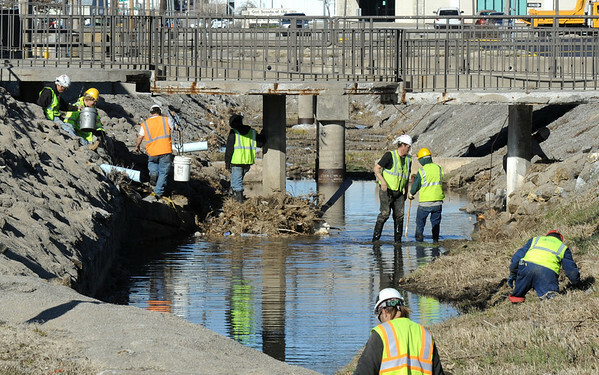 A crew of city of Joplin employees, through the Workforce Inforcement Board, clean up a creek just east of Vatterott College off Illinois Avenue and Murphy Boulevard Wednesday afternoon, Jan. 4, 2012. "We've been following the creeks for a while, a couple of miles at least, cleaning up tornado debris," said Matthew Starke, crew leader. "Some of this has been blown in or swept down the creek." "Back a ways, we found a couch and a matress," said Bobby Owens, crew member. "It took all eight of us but we got it out of there."